the shape of a ReactionLink to either orthogonal or polyline. the individual setting for each ReactionLink. Right-click on the target ReactionLink to open a pop-up menu. Move a Species and see the ReactionLink is always orthogonal. In the pop-up menu, select Adjust Connection. Select Preference - Connection Drawing... menu. The Default Reaction Setting dialog will popup. 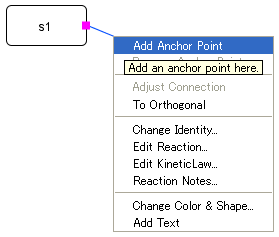 Select the shape of Connection Drawing: Polyline or Orthogonal.